preoccupation with all things edible. They eat with their hands and play with their food. They make interactive art events that use food to explore contemporary social codes and behavior. 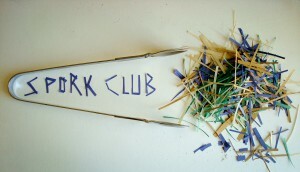 Spork Club website. The Spork Club took part in TINATA with: At The Table in May 2012. This entry was posted in Artists and tagged bio, profile, Spork Club. Bookmark the permalink.